They once got a ton of hype with radio, TV, and print ads, as well as billboard campaigns by proponents who later proved to be nothing less than sketchy. But the much-touted lap-band weight surgeries have fallen out of favor. The number of the procedures performed annually has nose-dived. Researchers, based on a longer view, are finding that, among bariatric weight-loss options, lap-band surgeries offer some of the poorest results and result in frequent added procedures—at big costs, both economic and to disappointed, suffering patients. Vox, the online news site, deserves credit for pulling together a painful review of what once was the most common way for overweight Americans, mostly women, to tackle one of the nation’s epidemic conditions: obesity. Doctors, starting in the early 2000’s, pushed bariatric surgery, various means to constrict the stomach and food intake, as a new way for heavy patients to lose big amounts of weight, quickly and without the stresses and strains of exercise and rigorous dieting. Various procedures became trendy but Vox says lap-banding, with a device surgically installed to reduce stomach capacity, pushed to the fore. That’s because, unlike surgically created sleeves or other bypasses, the lap band could be taken out and reversed. Its surgical costs seemed relatively affordable. But after Medicare has paid just under a half billion dollars for lap bands for patients nationwide for seven years, doctors and researchers see their major flaws. University of Michigan experts, for example, have found that 1 in 5 of 25,000 lap-band recipients they studied had follow-up surgeries, some to adjust the devices but many to remove them. National statistics show lap-band patients typically had 3.8 follow-up surgeries, far beyond statistics for other bariatric surgeries. Lap-bands dirty secret? 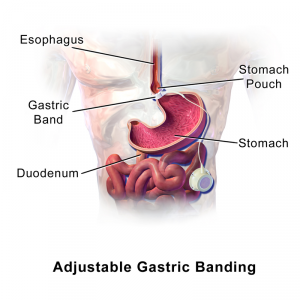 They fail to change patients’ eating habits, apparently because, unlike other bariatric surgeries, lap bands don’t trigger physiological and hormonal shifts that reduce hunger. Vox interviewed recipients who endured major pain to keep stuffing food through their constricted digestive systems. Some acted like anorexics, binging because they were feeling starved, then purging due to the gut pain they felt in their over-full bellies. Some took medications, such as heartburn drugs, to deal with their lap band-related discomfort. Others turned to crazy new eating habits, knowing they could gorge on high-calorie but soft foods (milk shakes, mashed potatoes, gravy-softened biscuits) because those slid by their smaller stomach openings. This, of course, also meant that they gained rather than lost weight. Lap-bands, early on, were the cause of significant patient complaints, especially in Southern California where investigations by the Los Angeles Times raised huge questions about one of the device’s makers and a clinic performing high-volumes of the procedures. In 20-20 hindsight, doctors may not have grasped fully and certainly didn’t make clear to too many patients that weight loss and control is a complex, sustained challenge requiring more than a one-time surgery. That cold, harsh reality keeps blowing up in a country where more than a third of us are obese and dealing with the terrible health consequences, including heart disease, diabetes, and various kinds of cancers. Here’s another awful aspect of lap-bands’ flop, and the mess with weight loss and control, in general: Women suffer with its consequences more than men do. Though obesity affects men and women roughly equally, 80 percent of bariatric surgery patients are women, many living in poorer, minority communities. Translation: American society, though changing, we hope, still pushes too many women to meet unfair expectations about their looks. We more readily fat-shame women. 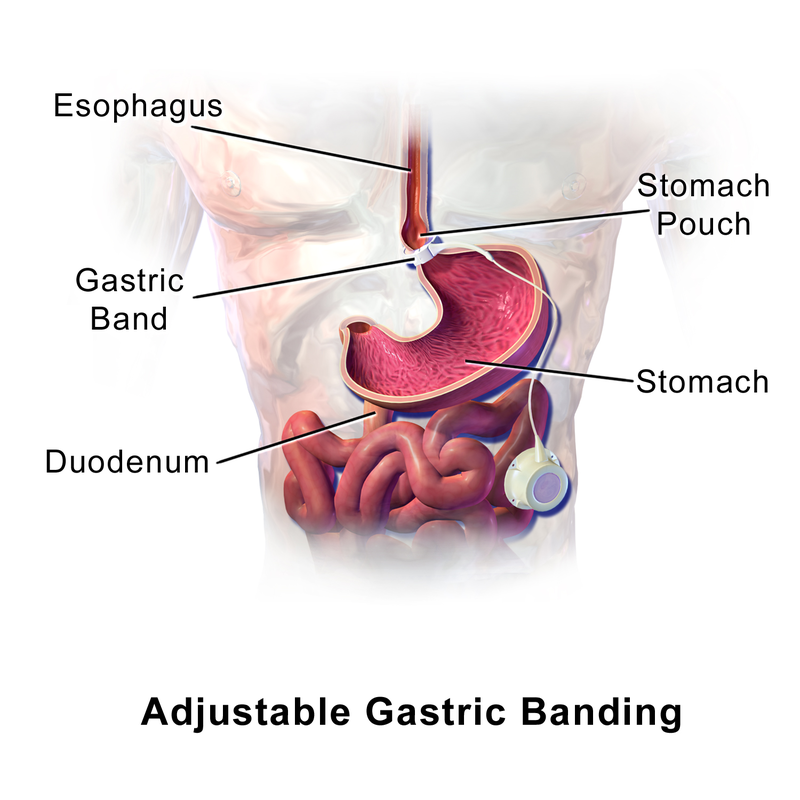 Although lap-band surgeries have dipped to just 5.7 percent of all bariatric procedures, surgeons will still perform 11,000 of them annually. When it comes to dangerous drugs and dodgy medical devices, the United States has a long, shameful history of mistreating women, a new study by the American Association for Justice finds. The group reviews decades of disasters for women’s health, including doctors urging “emotional,” moody, and even “hysterical” women to take everything from cocaine to morphine to barbiturates to tranquilizers to deal with their “female condition.” They also have been told to maintain feminine hygiene with products including bleach and talc, a common substance that juries are deciding is linked to cancers of female reproductive organs. and morcellators, laparoscopic surgical devices that are supposed to grind up tissues, such as in female reproductive organs, to speed surgeries but also may end up spreading cancer-causing particles throughout patients’ bodies. In my practice, I see the huge harms that patients can suffer while seeking medical services. It bothers me that women—who lead their spouses and families in taking care of themselves and act as their chief medical decision-makers—get such a bad deal from medicine. This inequity is in full display, too, in fiscal proposals from the Trump Administration and Congress on health insurance and the government’s role in health care. We made some progress in addressing gender disparities in medicine and health care. We’ve got a long way to go.